I think this is easily my favourite sort of outfit: high waisted shorts, cropped sweater, animal jewellery and thrifted accessories. The top has an amazing print of asian art inspired tigers or it could be tabby cats, either way its superb. I put on this hat when I went charity shopping with Holly earlier this week and we almost forgot it wasn't mine! I could have ended up walking out with it still on but luckily I remembered whilst I was at the till buying a super cheap jumper. The hat only cost 50p and I intend to wear it lots and lots. 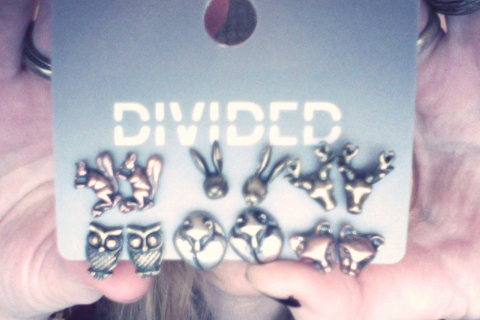 As promised here are the photos of the animal jewellery I got terribly excited about. I brought them from h&m yesterday and pretty much squealed with excitement when I saw them. I'm wearing the rings in the this outfit post. I just can't get enough of them. I love all the new illustrations you have put up! Love your look, and the drawings are very cute! Love this look - especially the cropped sweater and that beautiful bag! That jewellery is also insanely good and did I tell you that I'm in love with your illustrations?! Oh haha lvoed your story about that hat as I have done that amny times too. My friend has actually walked right now...then didn't know what to do! Love this outfit! You suit high waisted shorts so perfectly! Oooh, I especially love this illustration and outfit! The burgundy looks so pretty on you and I'm so in love with the high-waisted shorts! Great outfit Sarah! I love the top and shorts :) The animal earrings are SO cute; if I had my ears pierced, I would love them! love this outfit. and omg i love the illustrations on your blog!! I love all your rings, the owl one especially. you look gorgeous! and you are so talented. i love all of your drawings. this looks one of the best looks i've seen a bit i love itt! and those rings are so nice and look really good together. Your blog is lovely! I like it so much I decided to follow! I absolutely love that you include your illustrations with your outfits. Do you draw your outfit first to help you put it together, or do you wear it and then sketch it? I also enjoyed your thrifted hat story- what a find! I've only just bought a bowler that I stumbled upon reallyyyyy randomly at a super-reduced price. It made my week!! i really love the colour of your top! and your jewellery is so cute! definitely going to keep an eye out for them! rings are my favorite && so are animals. perfect combo in my eyes! love this post.